Milwaukee Tools is running a promotion for a FREE M12 3.0 Battery (48-11-2430) with the purchase of qualifying M12 Heated Jacket orders. It appears the offer is valid on both Kits and select (Jacket Only) purchases from Authorized Dealers of Milwaukee Tools. If you already have a charger, the free battery is a great way to get started with a heated jacket without having to steal a battery from your tools. If you are new to Milwaukee Tools, the Kit option comes with a charger and a battery, so the extra battery will give you some extra runtime. Here is the Rebate form. 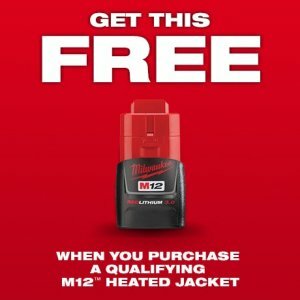 Here is a list of qualifying Milwaukee Heated Jackets.